Home Blog How Hard Is It to Learn How to Ride a Motorcycle? It takes more than the call of the open road and a leather jacket to ride a motorcycle. Learning to handle yourself on a motorbike can be as challenging as it is rewarding. Here are answers to some common questions posed by budding motorcycle enthusiasts. Where do you start to learn how to ride a motorcycle? First, prospective motorcyclists should realize that just because you can drive a car or ride a bicycle does not mean you can ride a motorcycle. Hopping on a motorcycle and practicing by yourself is not a recommended practice for beginners. Motorcycles are complex machines. Some of the maneuvers, such as turning, are quite different than they are on a bicycle or a car! If you don’t learn to drive properly, it can be dangerous. Motorcycles are huge and heavy. You are not protected by cushions and metal the way you are in a car. One simple move, frankly, if it’s the wrong one, can be enough to kill you, or someone else. You should learn how to drive a motorcycle from the ground up. Fortunately, there are many great places to learn. One good place to start is with beginning courses at a reputable organization, such as the U.S. Motorcycle Safety Foundation (MSF). They offer courses that combine learning the rules of the road and getting hands-on practice under the eye of a trained instructor. A good beginning course, such as MSF’s, will start with educational material. You’ll learn the basics of motorcycle organization, plus the rules of the road. After that, you can generally take the Division of Motor Vehicles exam. Then, you take practice runs in a safe place, such as a large deserted parking lot, with a trained instructor. It’s done just like many people learn to drive a car. You practice driving straight, braking, turning, and other basic maneuvers. After that, you practice in traffic, also under a trained instructor’s eye. Then, it’s necessary to practice on your own. Again, a workable analogy is learning to drive a car. You could drive after you obtained a learner’s permit, but you still needed practice. How long does it take to learn how to ride a motorcycle? The basic rider’s course through the MSF takes 20 hours to complete, evenly split between coursework and hands-on driving experience. You must also read on your own to take the DMV exam, brush up on the material, and so on. People vary in the amount of practice they need to become fully proficient at maneuvering a motorcycle and riding it. Expect it to take more than 20 hours! Your safety is more important than anything else. You need to practice riding until you know how to do everything well enough to be safe. How hard is it to learn to ride a motorcycle? If you have learned to ride a bicycle and drive a car, you will be able to learn to ride a motorcycle. Know, though, that it is different than those activities. Turning will be more difficult. You will need to always wear a helmet and practice safety precautions. But millions of people have learned to ride, and so can you! Motorcycling is a great activity. However, motorcycle accidents can severely injure riders and passengers. 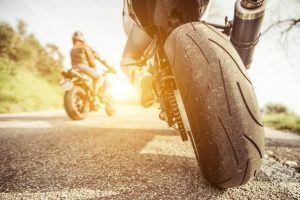 Motorcycle riders are not cushioned like vehicle riders are, and other vehicles often don’t pay sufficient attention to motorcycles on the roadway. If you or a loved one needs a Los Angeles motorcycle accident attorney, we can help. Ellis Injury Law has been successfully litigating motorcycle accidents in Los Angeles for more than 20 years. Let us help you with our expertise. Contact us today at 310-641-3335 for a complimentary consultation. We accept no fees unless we win money for you!